It’s fun to watch kids get excited about learning. 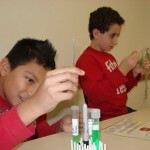 When 36 fifth grade SEARCH program students from Woodhull Intermediate School traveled to the DNA Learning Center in Cold Spring Harbor for a day of exploration and experimentation, plenty of intellectual fire power was put on display. 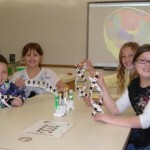 The youngsters have been immersed in a 16-week unit on genetics and biology. “This field trip was specifically designed to enhance and reinforce the importance of the double helix,” said Maryann Daly, SEARCH (Scholastic Enrichment and Resource for the Children in Huntington) program chair-teacher. 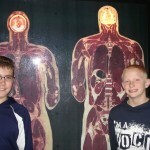 The fifth graders spent the day participating in the hands-on learning stations arranged in the center’s museum. “They had the chance to analyze their individual fingerprints, determine whether or not they were colorblind, study the traits of identical twins and marvel at the ceiling to floor model of the structure of DNA,” Mrs. Daly said. The current group of SEARCH fifth graders comes to class each week eager to learn advanced concepts in science, “It is a pleasure to be apart of their excitement,” Mrs. Daly said. “I will not be surprised if we see some of these fifth grade students become future Siemens science finalists, just like Holly Flores, who was a SEARCH student attending these same classes seven years ago. Many SEARCH participants have gone on to earn academic honors over the past three decades. Andrew Ku, a leading member of Huntington High School’s Class of 2012, who is among the leading alumni of the SEARCH program, is currently interning at Cold Spring Harbor Lab.